Way back in 2005, I heard a sermon that many of us still remember. The speaker (Elder David A. Bednar) talked about tender mercies, a term that is mentioned numerous times in the Old Testament and in The Book of Mormon. If you want to listen to the talk, you will find it here. People are still talking about that sermon, and with good reason. It opened a lot of eyes and touched a lot of hearts. Elder Bednar explained that tender mercies are the little things that God sometimes does just to show us that He loves us and knows about us, even though our cares and concerns should seem microscopically insignificant to someone so powerful. These are usually not direct answers to prayer, but are often sent our way just to remind us that we are loved and our concerns have not been forgotten. I guess I was thinking of this because of the tender mercy I received a week ago. We went grocery shopping, which is a typical Saturday ritual for us. Our tradition is that Fluffy pays for the staples at the supermarket, and I will often pay for just a few little treats that we can share. So he will buy the milk, eggs, produce, and meat, and I will buy something fun like a triple-berry pie or ice cream. It’s my way of showing my appreciation for all the things that Fluffy does for me. He pays for the necessities, and I pay for the treats. Because I am trying to get out of debt, I have put myself on a strict budget. I have one of those pre-loaded debit cards, and Fluffy transfers my allowance onto the card at the first of each month. When the card stops working, my spending stops for that month. By the third week of August I thought I was in pretty good shape, because my check register said I still had $154 to get me through the month. But then I checked my balance on the bank’s website, and was shocked to see I only had $37 left to get me through almost two weeks. When Fluffy listed the card transactions, he found several large purchases that I had failed to record, and a couple where the amount I recorded was too low. (The largest purchase was something Fluffy had made for me and then had failed to give me the receipt, so I wasn’t the only one who fell down on the job!) August was also an unusual month because of three birthdays, a wedding, and two pairs of shoes I had to purchase to wear over my leg bandages, so I should have known I didn’t have as much money as I thought I did. The prospect of two weeks without any money to spend was more than a little distressing. This was not something that was going to ruin my life, mind you, but it was something that made me a little sad because I couldn’t spoil Fluffy in the way I wanted to do. Fluffy does so many good things for me that he deserves all the spoilage he can get. Accordingly, I limited my spending Saturday at the grocery store to just a few items, fervently wishing that I could buy more. When we got home and started unpacking the groceries, the first thing I noticed was an entire plastic sack full of items that we did not put in our cart. This was a pain in the neck, because we live more than ten miles from the supermarket and we weren’t intending to return for more than a week. I’m not about to steal someone else’s groceries, so I immediately called the supermarket and talked to one of the managers. He asked for a complete list of all of the surprise items that had made their way home with us. He wrote down each item, along with its size and price. The manager informed us that we didn’t need to take the items back. Because of packaging and sanitation laws, the store would not be allowed to restock any of the items. He told us to just enjoy them, and thanked us for calling to let them know. Now if the original purchaser of the items contacted the store, the manager would have a list of the items and would be happy to replace them. 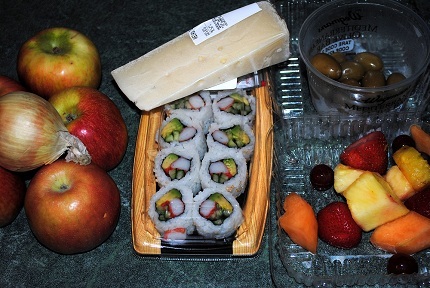 So it really was a win-win situation for everyone (although I’m sure the original purchaser of the items may have been slightly disgruntled to get home for a sushi, fruit and olive lunch that wasn’t there). Afterwards, Fluffy proposed a theory about the origin of the lagniappe items. We had taken a couple of reusable cloth grocery bags with us, but we put groceries on top of them and forgot all about the bags. Halfway through the checkout process, we remembered the bags and gave them to the employee. She had already started filling several plastic sacks with our goods, and just put all the plastic sacks inside the cloth bags. Fluffy’s theory is that the mystery groceries belonged to the previous shopper, a young girl who seemed to be paying more attention to her cell phone than to the checkout process. He suspects she left one of her plastic bags in the checkout area, and it just got swept into our bags without anyone being the wiser. What really amazed us were the contents of our mystery bag. None of it was junk food. None of it was nasty, chemical-laden stuff. With the possible exception of the onion, which was something Fluffy usually pays for, the bag contained the same sort of treasures that I would have been buying if I had not felt so poor. Both of us love fresh fruit and olives, and we have a real fondness for the cheese-stuffed olives and the garlic-stuffed olives that the previous shopper had chosen. I keep a supply of apples in my office when I can afford them (and these were the sweet variety that I like rather than the tart ones that everyone else seems to favor). Fluffy likes the hard white cheeses, although even when I can afford to buy them I usually get the cheap Jarlsberg and not a fancy Italian one with an unpronounceable name. And even though we’re not big fans of sushi when it contains raw seafood, we do like the cooked California rolls. So we had a Sunday lunch containing many delicacies that we never expected to be eating. As someone who has had her share of tender mercies, I would have to say that I strongly share Elder Bednar’s opinion. I hope we always remember to look for the tender mercies in our lives, and will acknowledge them not just for the incidents themselves, but for the evidence they give us that God lives, and that He loves us — every one.